While some critics within the tech media have heavily scrutinized the Apple Watch since its launch, new survey data shared by Techpinions suggests that the true mass market sentiment toward the wrist-worn device is overwhelmingly positive. In particular, the survey found that traditionally "non-tech" users liked the Apple Watch more than those with a closer connection to the tech industry. According to research firm Wristly and Creative Strategies analyst Ben Bajarin, overall customer satisfaction with the Apple Watch is 97%, which is the highest customer satisfaction rating of any first-generation Apple product ever released. Wristly determined that rating by combining the "Very Satisfied/Delighted" (66%) and "Somewhat Satisfied" (31%) boxes together. The survey data is based on the Wristly Apple Watch Owner Network, a diversified panel of over a thousand Apple Watch buyers. Wristly says that it asked respondents a series of pre-qualification questions to ensure that the panel did not skew towards only early adopters and instead represented a healthy range of consumers. Among those profiled, Wristly found 34% to be "tech insiders" and 53% to be "non-tech" users. What has been fascinating about the Wristly Apple Watch Panel is how diverse it is across the adoption cycle spectrum. We have those on the bleeding edge of adoption all the way through mainstream consumers who aren’t buying it for the sake of Apple fanaticism or love of tech and gadgetry but because they saw the utility and usefulness of the product right off the bat. They are all represented in our panel. 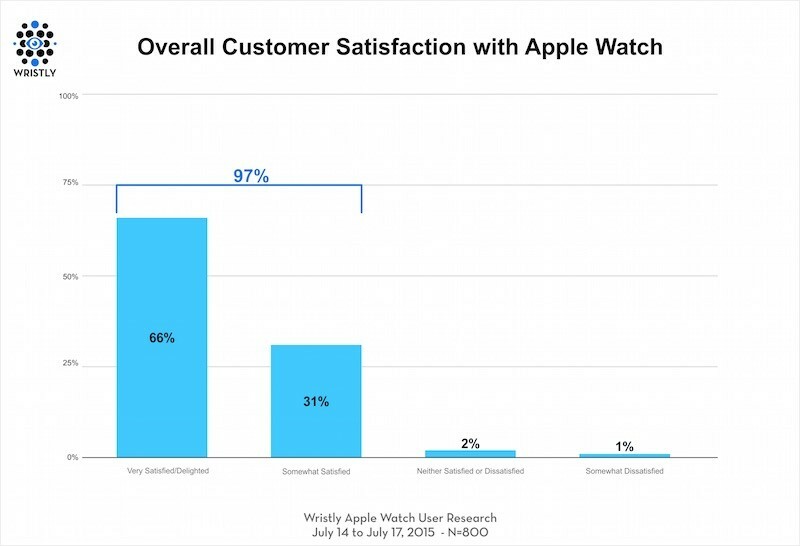 Apple Watch customer satisfaction was found to be higher than the original iPhone and iPad, which scored 92% and 91% ratings respectively, although satisfaction levels were contrasting among different types of users. 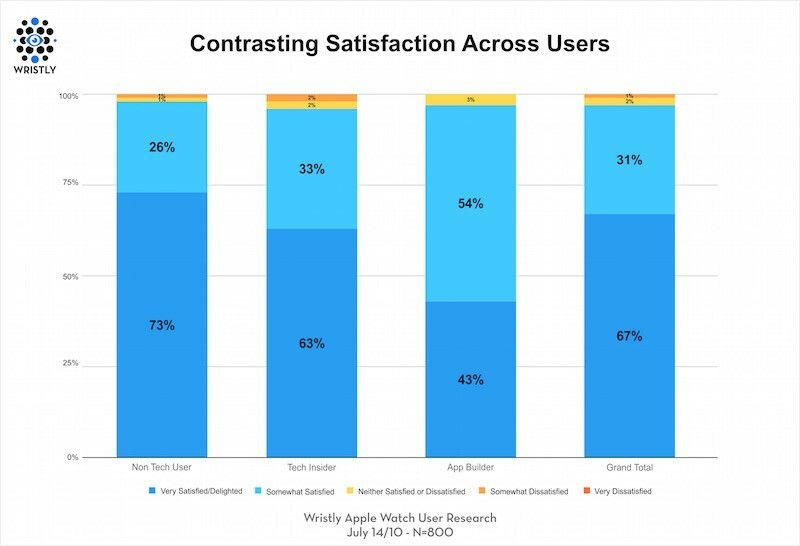 "Non-tech" users and "tech insiders" were most satisfied with the Apple Watch, while "app builders" were slightly less satisfied, with less than half choosing the "Very Satisfied" box. Apple has not publicly disclosed any official Apple Watch sales figures to date, and will be grouping the wrist-worn device under its "Other Products" category in quarterly earnings reports. Apple Watch global sales estimates range between 2.8 million and 5.7 million ahead of the company's third quarter fiscal results set to be announced on Tuesday at 1:30 PM Pacific. It is. Otherwise they would say neither or not satisfied. Kind of surprising considering all the people selling the Watch as soon as it's landed on their doormat. Myself included btw. Why is it so impossible for people to believe that a very well design, very well built, and well liked product could also be a flop? As I typed that, I was reminded of the Sega Dreamcast. It had better graphics than any other game console out at the time. It was the first game console with a built-in modem for online multiplayer. Not to mention dozens of other innovations. Everyone that had one absolutely loved it. Yet, it is considered a huge flop. Maybe the pricing isn't quite right. Maybe some of the functionality is released too soon - there is a "right time" for new features to really flourish. Maybe the product is amazing, but it is a solution in search of a problem. Sometimes great products flop. It's not impossible. The question is: to what degree does being satisfied with the product mean that the customers are actually using it regularly? I own an Apple Watch, and I don't have many complaints about the device, it functions well... but it still doesn't find its way onto my wrist very often. Try wearing it all of the time. Then try and go without it. I can't fathom how it can be something you only use when you feel like it, kinda defeats the point. That's a disingenuous conclusion to make from this survey. Only 66% are very satisfied. Both of which are ranked above "neither satisfied or dissatisfied", which means they're satisfied. Your inflammatory nonsense has become tiresome. The major issue for many people is the Cost...thats going to hit Apple when the hype dies down.